The Black Magic Manifestation Program! Are you a beginner in Black Magick, and you have the urge, or need, to wield your power right now? Is there an urgent challenge pressing you that requires immediate action now? Are you a seasoned Black Magician ready and willing to expand his/her power? 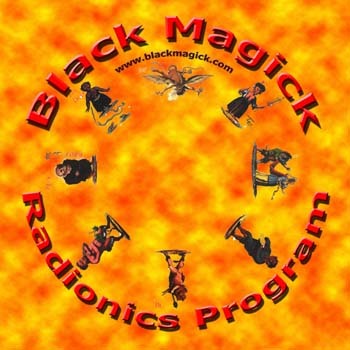 THE BLACK MAGIC MANIFESTATION PROGRAM is the first program of its kind that is exclusively designed for the black magician. By now you know it: a radionics setting, or rate, is a universal magickal sigil. (1) A setting that is designed to represent the basic supporting energy that you use. This helps you tune into the general field of your operation. This is an ideal setting to include any amplifier of power! (2) A setting that is designed to effect the environment of your target: Set a positive environment for positive spell work, set an environment of hatred, general failure, or violence for destructive spells. (3) Lastly, to prevent repercussion from becoming a problem that can haunt you, there is a setting for an alternative target. For all these reasons, the Black Magic Manifestation Program is the ultimate weapon for the Black Magician. It is a must whenever you are serious to wield your magickal powers for your overall success and to cause the change that you have desired all the time! Therefore get your Black Magic Manifestation CD now! (3) Over 150 letter squares from the book "the Sacred Magick of Abramelin the Mage"
The Black Magick Power Card - ideal to boost the software!